Blazer Brass has become a staple of affordable range training, and is trusted by avid shooters all over the country for their training needs. 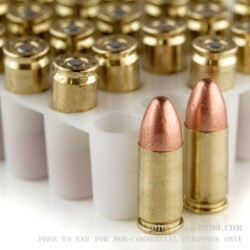 This ammo is with a standard weight 124 grain full metal jacket bullet, and is loaded into a Boxer primed brass case. 124 grain bullets in 9mm are best suited for compact pistols like the Glock 19 or Sig 250C, and for full size pistols like the Glock 17 and Smith & Wesson M&P. Many people find that 124 grain ammo is just a bit too snappy for sub-compact pistols. This ammo will have very similar felt recoil and trajectory to 124 grain defensive loads made by premium manufacturers like Hornady and Federal. Too snappy? No way. Accurate fairly clean, and affordable. Be prepared to clean your gun more often. Good consistent performance, but about 10 X the residue than Remington Bulk I had been shooting. Also some noticeable smoke at the range. good ammo and a great price. It's american made also. I got my monry's worth! Great Ammo, Made in the USA!!!! Quick shipment, good price and I like the ammo a lot. Geat product! Large box built for the 9MM amo, 20 fifty round boxes inside. At this price per box of 50 (NEW) rounds is a great bargain. My first visit to bulk ammo. I was just looking at different ammo sites. Then I found bulk ammo and joined the site. I also placed my first order right then. Bulk ammo had a very good deal on 9mm ammo. My order was delivered two days later. Thank you bulk ammo for your quick and easy service. Everyone should use your site. Perfect Ammo that doesn't have any reliability issues at reasonable cost. I recently purchased a Ruger SR9 for myself and a LC9 for my wife. Locally, ammo is not always reasonable in price or quantity availability, so I made the decision to check out what Bulk had available. Went to the range and both of these took to the ammo with not a single problem. Purchased this product, shipped out the same day and I received it two days later. Great Customer Service. awsome price and works great. Good quality, and clean shooting. 100% Reliable threw 500 of the 1000. For the price you can't go wrong with this ammo. This is my second time around this ammo and haven't had a single issue with it... (M&P 9mm) "Cheaper" than the other ammo accurate, reliable, and decently clean ammo. What else can you ask for! P.S. Excellent BULK AMMO customer service and quick affordable shipping. 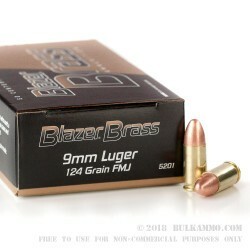 Q: Is this Blazer 9mm ammo reloads. A: Hello! 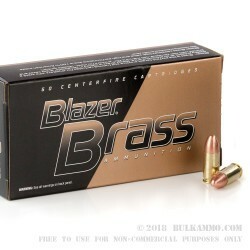 The Blazer Brass ammunition is new manufacture. Q: New ammo or reloads? A: Hello Eric, The Blazer Brass ammunition is all new manufacture. A: Hello Roland, Blazer Brass lists the velocity of this round at 1090 fps although they do not specify the barrel length used in the testing. 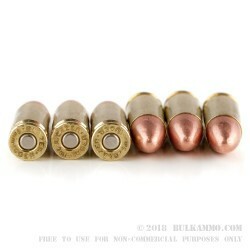 Q: Can you confirm these are brass rounds and not aluminum? Reloadable or not? A: The Blazer Brass line of ammo is loaded with the traditional brass cartridges and are NOT aluminum or steel. Additionally, they are boxer primed which will work for any reloading needs.